As many of you know, this summer I've been settling back into the homestead where I grew up in rural New Brunswick, after ditching the Toronto area and the fast paced 9-5 big city lifestyle. In addition to being back with family and friends, I was craving the stillness of nature and the freedom to explore where my creativity may take me. It's been amazing, and I am truly blessed to have land, a home, a supportive family and true friends surrounding me. I've been eating fresh veggies from the garden every day, breathing clean air and listening to the breeze in the trees, chatting with the hens in my dooryard, and counting stars in the brilliant clear night sky. I wouldn't trade it for the world. But....living a simple life is not as simple as moving to the country and quitting your day job (you can read more about why I decided to make this move in the first place). I've been having to adjust to the quirks and non-stop work of rural living, which I conveniently forgot about in my time away. There's weeding, watering, slug seeking and harvesting from our organic gardens - daily tasks not to be shrugged off as insignificant. The hens need watering and feeding, and gathering eggs is an interesting chore (I'll never be fine with reaching under a hen's behind to scoop out warm eggs). Firewood for winter has been split and piled. There are a hundred fix ups slowly being crossed off the to-do list for my home, my parents' and the barns and outbuildings on our property. I've battled wasps, ants and a mouse infestation. Is this the slow, simple life I envisioned? Well...sort of. Even though I've been too busy to work as much as I wanted on my business and I flop into bed each night exhausted, I can't wait to get up the next morning and do it all over again. My life is a different kind of busy, yet feels for the most part uncluttered. I don't have deadlines and meetings and a full calendar making me anxious every Sunday night. I don't have trains to rush to or traffic to avoid. I don't have big box stores around the corner that tempt me to buy lots of 'stuff'. I don't have to go grocery shopping nearly as often since we grow a lot of our own food. And I have the unstructured time in any given day to drop what I'm doing and hang out with a friend antique scouting. Are there still complications in my life? Of course. But I feel like the decluttering I've done and the intentional choice to do less is beginning to free up my mind to focus on bigger things. Like building a sustainable business that will help others as well as celebrate nature. Like volunteering and serving my community and those less fortunate. Like spending quality time with family. Like leaving a legacy. It's the freeing the mind part that I believe to be key. Decluttering my mind to focus on the present, and on the kind of impact I want to have in this life, is where the real value in simple living lies. For me that means connecting more closely with nature and my roots, and giving myself time to explore my own creative pursuits instead of working for someone else. But I believe living a simple life can take on many forms as long it declutters your mind. Not everyone has the option to live in nature and give up a steady paycheck (or the desire to for that matter). I would venture that it's not needed to live simply and naturally; what is needed is a healthy lifestyle that allows us stillness and room to contribute. That might mean decluttering and organizing our drawers so we don't waste time and mental capacity always trying to find things. It may mean getting up a half hour earlier to have time to practice meditating or journalling. And it hopefully means buying less stuff and creating more memories instead. The two things I've learned so far on this little journey of mine is that 1) giving my full attention to the people and things that really matter is the most important thing I can do; and 2) I need to be kind to myself. Just because I believe in reclaiming and not consuming so many new things doesn't mean I can't buy anything. It doesn't make me a bad person if I do. It's making the most of the things I do own that matters, not trying to own as few things as possible. And while I'm not standing in line to get Starbucks twice a day any more, I do still allow myself a latte from time to time. I just make sure to enjoy it even more! As I continue on this path to a simpler, more natural life, I'll share lessons learned. 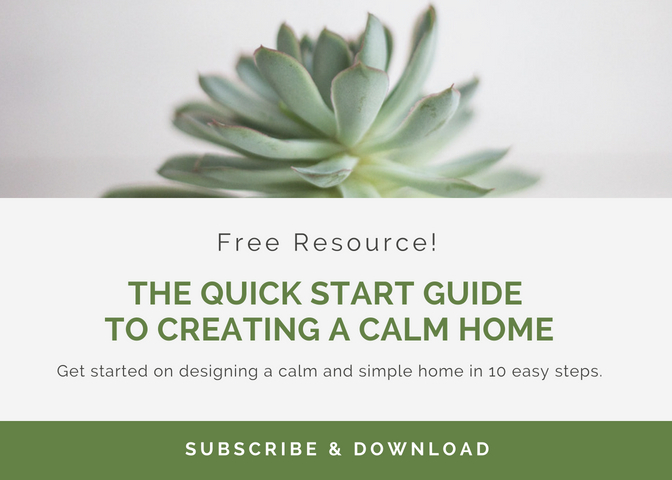 I hope to be able to inspire you and offer practical tips on how you can create a home, whether rural or urban, that allows you to live a meaningful, simple and beautiful life. And I would truly appreciate your insights on if and how you may already be living a simpler life. Please join me here in the comments or on Twitter or Instagram and share your thoughts.